Russian physician and author; born at Wilna in the first half of the eighteenth century; died at Grodno Nov. 12, 1797. He graduated in medicine from the University of Padua, traveled extensively through Europe, and settled in Wilna, where he was appointed physician to the Jewish community. Later he practised medicine at Ponedeli, Zhagory, and Mitau, and finally settled in Grodno. In 1765 he traveled through Germany and to Amsterdam. 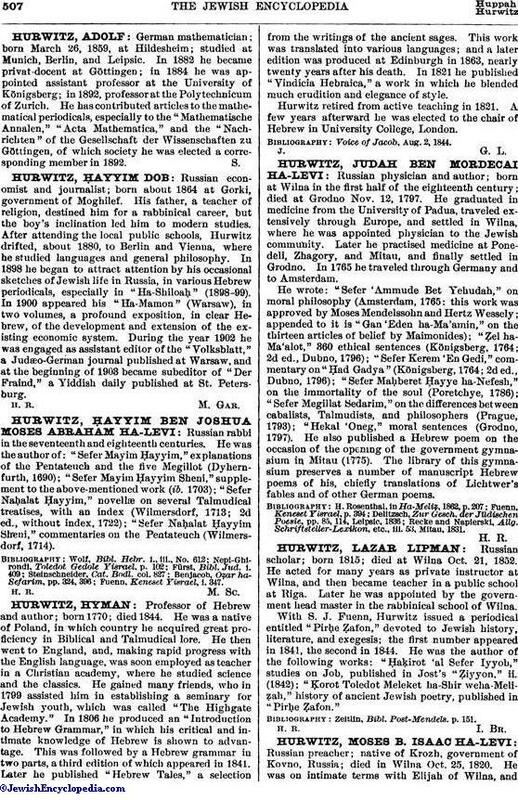 He wrote: "Sefer 'Ammude Bet Yehudah," on moral philosophy (Amsterdam, 1765: this work was approved by Moses Mendelssohn and Hertz Wessely; appended to it is "Gan 'Eden ha-Ma'amin," on the thirteen articles of belief by Maimonides); "Ẓel ha-Ma'alot," 360 ethical sentences (Königsberg, 1764; 2d ed., Dubno, 1796); "Sefer Kerem 'En Gedi," commentary on "Ḥad Gadya" (Königsberg, 1764; 2d ed., Dubno, 1796); "Sefer Maḥberet Ḥayye ha-Nefesh," on the immortality of the soul (Poretchye, 1786); "Sefer Megillat Sedarim," on the differences between cabalists, Talmudists, and philosophers (Prague, 1793); "Hekal 'Oneg," moral sentences (Grodno, 1797). He also published a Hebrew poem on the occasion of the opening of the government gymnasium in Mitau (1775). The library of this gymnasium preserves a number of manuscript Hebrew poems of his, chiefly translations of Lichtwer's fables and of other German poems. Recke and Napierski, Allg. Schriftsteller-Lexikon, etc., iii. 53, Mitau, 1831.